The 2018 InternationalStudent.com Viewers’ Choice Winner and Finalists Have Been Named! 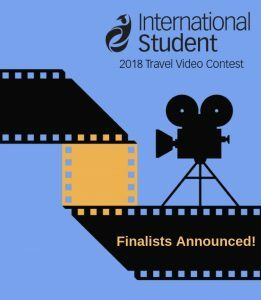 After receiving numerous video entries for the InternationalStudent.com Travel Video Contest, the 12 finalists, including the Viewers’ Choice Winner have been announced! Like every year, students from around the world put all their effort, time, dedication and creativity into their video entry to express their desire to experience life outside their home country. Each entry was thoughtful and the InternationalStudent.com team had a difficult time narrowing the list of entries. We invite you to meet the 12 finalists and hear their stories, as from that bunch three lucky winners will be chosen for the first, second and third place! As in past years, this year we have an incredible judging panel who will determine the three winners which will be announced on the last day of the International Education Week: November 16th. Make sure you watch the Viewers’ Choice winning video: Leaving Routine Behind, where Kaleema Lowery shares with us how her life has become a routine that doesn’t bring her greater happiness. She wants to see the world, meet new people, learn new languages, make new memories and especially leave the routine behind! But she can’t do everything at once and for now, she chose South Korea where she’ll have the opportunity to live an experience different from what she has been living at home.